In 28 states, car buyers can drive off dealers’ lots with their license plates mounted and registration forms in hand. All thanks to electronic registration, in which signed forms are submitted to states online without a time-consuming visit to a state motor vehicles office. But even with the benefits, some experts doubt that e-registration will adopt a convenient national standard or even become mandatory in all states because of legal barriers and insufficient sales in various states to justify the expense of establishing it. “There are some states where the population and number of vehicles is so small, I just don’t think in the next 10 years it’s going to be there,” said Janet Michels, general manager of Computer Vehicle Registration, an e-registration provider founded by CDK Global and Reynolds and Reynolds. Many providers, such as Computer Vehicle Registration and Motor Vehicle Software Corp., have resisted pushing e-registration in some states because of low vehicle volume. Also providing e-registration are Dealertrack Technologies and TitleTec. Electronic registration has been around for about 20 years, and it’s consistently picked up momentum. With electronic registration, dealership F&I managers print out the necessary forms, the customer signs them and the information is electronically filed with the dealer management system. The provider audits the information and then electronically submits it to a state’s motor vehicles office. It speeds up the process and adds heightened security for dealers, but “the No. 1 benefit is for the customer. They can actually receive their registration and license plate at the point of sale,” said Terry Burns, executive vice president of the Michigan Automobile Dealers Association. Customers still receive title documents by mail, but Rasheed Creary, business manager at Sutliff Volkswagen in Harrisburg, Pa., said his customers receive titling forms in “two weeks tops,” compared to at least one month before using electronic registration. In Michigan, where e-registration is optional, nearly 80 percent of new-vehicle dealers register their customers electronically, Burns said. Michigan started offering e-registration in 2005, and since then it’s continually grown, but Burns doesn’t see it becoming mandatory. “Many people asked for it to be mandatory, but I think we’ll be at 100 percent [participation] within a couple of years,” he said. 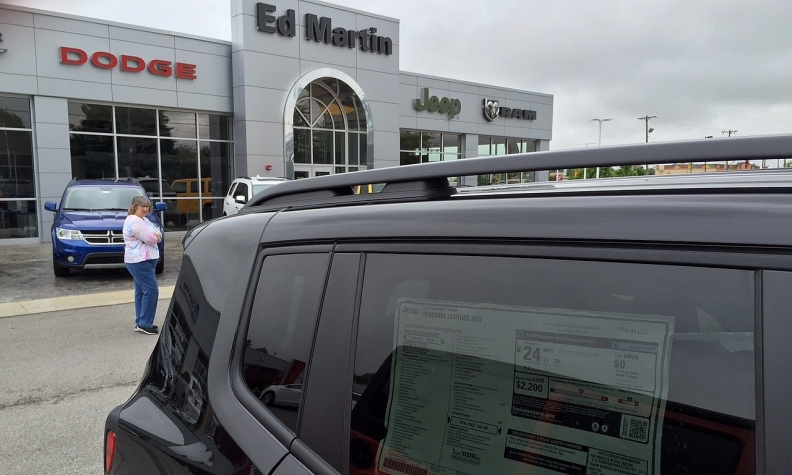 Dealers see the value of electronic registration, so a mandate isn’t necessary, he said. National adoption of standard procedures for electronic registration would be ideal, Burns said. But in some states, certain laws stand in the way. So far, California, Illinois, Maryland, Massachusetts, Virginia and Wisconsin have made e-registration mandatory for new-vehicle dealers, according to Motor Vehicle Software Corp.’s data. Documents’ error rates have been much lower since e-registration has become mandatory in Illinois, said Pete Sander, president of the Illinois Automobile Dealers Association. “It’s a win-win for the state, dealers and consumers,” Sander said. Without a standard national system for e-registration, providers have to make forms state-by-state. And in many states, each county handles registration, adding another roadblock for those states trying to launch electronic registration. “It’s a real challenge for dealers but a huge challenge for fleet companies working all over the state. They may be dealing with 50 counties in a state,” said Brueggeman. Electronic registration is not allowed in some states because of statutes already in place. For example, in Washington, the Department of Licensing and county auditors contract with private businesses that act as “subagents,” or licensing agents. These subagents obtain registration data from consumers and send it to the state’s Department of Licensing, said Bryan Imai, senior general counsel for the Washington State Auto Dealers Association. Any business can apply and be awarded a subagency appointment. A dealership could apply to be a subagent, but Imai said he has not heard of a dealership doing so. Despite this statute, “dealerships would be interested in anything that would make the process more seamless and quick and improve the buying experience,” he said. Technology and speed are so prevalent in other industries that most expect them to be a part of the car-buying experience. “Every state that adds electronic registration just adds more pressure on the rest of the states,” Brueggeman said.